680 pages | 53 Color Illus. | 51 B/W Illus. 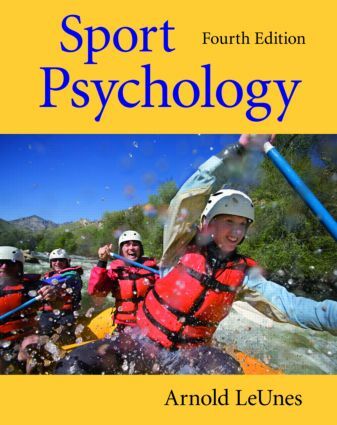 This updated fourth edition of Arnold LeUnes’s textbook has comprehensive coverage of sport psychology with a healthy balance between theory and application. The strong applied approach is emphasized throughout but is essentially apparent in the second half of the book. The book features a strong pedagogical program including interesting applied vignettes, chapter outlines, emboldened key terms with glossary, very thorough chapter summaries, student-oriented suggested readings, and numerous tables and figures to visually summarize the key concepts. The book’s shorter chapters make it easier to assign one per class. In addition, a website of supplemental resources, free of charge to qualified adopters, makes this new edition even more accessible and student-friendly. Preface. Part 1. Introducing Sport Psychology and Sport History. An Introduction to Sport Psychology. Professional Issues in Sport Psychology. Sport History: Antiquity Through the Renaissance and the Age of Enlightenment. History of Sport and Sport Psychology in the United States. Part 2. Behavioral Principles and Applications. Behavioral Principles. Anxiety and Arousal. Anxiety Reduction: Classical Conditioning and Operant Learning Applications. Anxiety Reduction: Cognitive Learning Techniques. Part 3. Social Psychological Dimensions. Motivation: Attribution Theory and Need Achievement. Motivation: Locus of Control and Self Theory. Social Psychology of Sport: Leadership and Group Cohesion. Social Psychology of Sport: Audience Effects. Aggression: Dimensions and Theories. Aggression: Violence in Selected Sport Populations. Part 4. Personality, Assessment, and Special Athletic Populations. Personality and Psychological Assessment. Psychological Assessment in Sport Psychology. Minority Athletes. High-Risk Sport/The Elite Athlete. Athletes With Disabilities/Injured Athletes. Doping in Sports. The Female Sport Experience: Historical and Physiological Issues. The Female Sport Experience: Sport Socialization, Psychological Variables, and Other Issues. Youth Sport: Motives for Participating and Withdrawing. Youth Sport: Stress and Other Issues. Part 5. Coaching and Exercise. The Coach: Roles, Communication, and Psychological Variables. Youth, Female, and Black Coaches: Coaching Burnout. Exercise Psychology: Physical Fitness, Adherence, and Cognitive and Affective Benefits. Exercise Psychology: Running Addictions and Exercise for Senior Citizens. Glossary. Arnold LeUnes received his three degrees from Texas A&M University (1960) and University of North Texas (1961, 1969). Professor LeUnes joined the Psychology faculty at Texas A&M University in 1966 and his teaching focus has been primarily abnormal psychology and sport psychology. He was a three-year starter at tailback in football, district champion in the 100- and 220-yard dashes, a state track meet qualifier, and ran sprints and hurdles in college for a year. Professor LeUnes has been awarded three distinguished teaching awards and at the same time has authored five books, generated 100+ articles, and presented 100+ papers at assorted conferences.